Every March and April Riverbend Park staff are flooded with phone calls from people wanting to know, “Are the bluebells in bloom yet? When will they be at peak bloom?” I love the fact that people from the Washington region get excited each year to come out and witness one of the great colorful displays of springtime. What’s even more exciting is when people ask what other flowers they might see. How do you explain to them that they are standing in one of the most biologically diverse ecosystems found along the East Coast of North America? 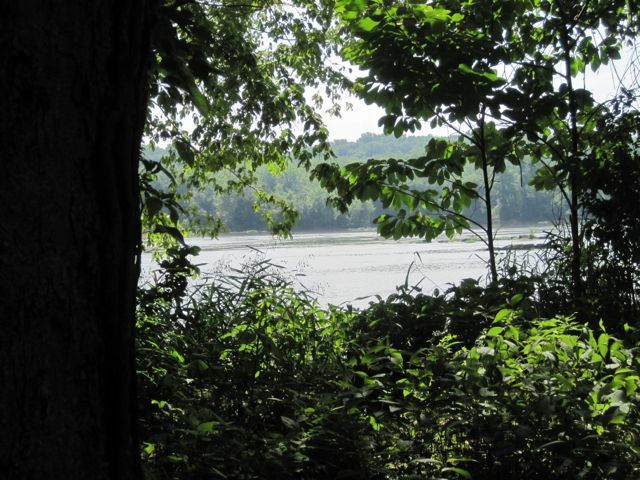 Riverbend Park is 419 acres located on 2 1/2 miles of the Potomac River shoreline in Great Falls, Virginia. Because it is on the inside of a very large bend in the river, floodwaters tend to slow down as they pass over, depositing soils and seeds from deep in the Appalachian mountains and valleys of West Virginia, Western Maryland, Pennsylvania and the Shenandoah Valley, introducing species to the park that might not otherwise be found in the region. Thus Riverbend shares in the Potomac Gorge’s biological diversity as an East Coast ecological hotspot. For more than 12,000 years what is now Riverbend Park was heavily used by American Indians. Riverbend contains more American Indian sites than any other park in Fairfax County. By sometime in the 1700’s the American Indians vacated the land as settlers pushed in. In the early 1790’s an enterprising character by the name of Hugh Conn purchased three parcels totaling about 150 acres on which he grew tobacco and corn and ran a ferry. After his death in 1806, his wife and sons continued to operate the ferry, which saw its moment of fame in August, 1814, when President James Madison fled to Virginia and used Conn’s Ferry to cross back into Maryland to link up with his troops. Parts of Riverbend were farmed as late as the 1950’s. Other parts remained forested and were used as fishing camps and lodges for Washingtonians to escape to for recreation. In the early 1900’s Riverbend became a haven for making moonshine. The local corn, deep hollows, and abundant creeks made this an ideal place for producing illegal liquor. Finally in the 1960’s and 70’s the various local and federal governments realized they needed to protect the Potomac River Watershed and began buying up the land along the river, or in some cases claiming it by eminent domain. This ultimately resulted in the park land now designated as Riverbend Park. Today the park is open year round for everyone to enjoy. It has approximately 10 miles of maintained trails, a visitor center that is open six days a week, being closed only on Tuesdays, a boat ramp, a boat marina and a large picnic area, and some of the most significant natural plant communities anywhere in the Washington region. Today the large meadow that used to be Conn’s Farm contains tall native grasses such as Indian Grass, (Sorghastrum nutans), Little Bluestem, (Schizachyrium scoparium), and a very rare grass in this region known as Sugarcane Plumegrass, (Saccharum giganteum). One year we bush hogged some invasive plants out in the middle of the large meadow. As I walked through the giant open swath to inspect what plants were growing I spied a diminutive orchid at the base of the six foot grasses. 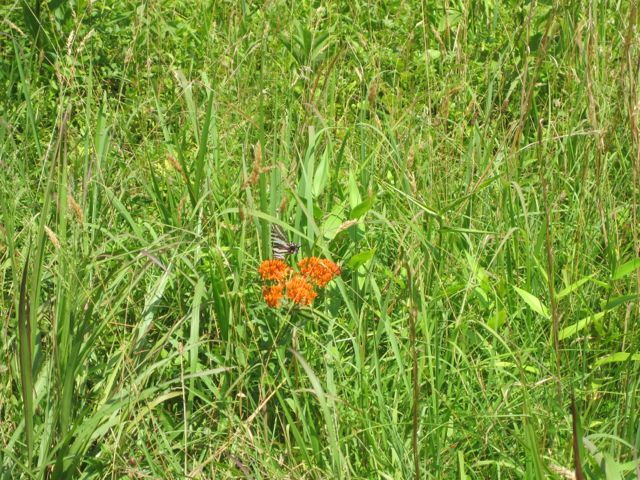 There are five species of milkweeds in the meadow: Common Milkweed, (Asclepias syriaca), Swamp Milkweed, (A. incarnata), Purple Milkweed, (A. purpurascens), Blunt-leaved Milkweed, (A. amplexicaulis) and Butterfly weed, (A. tuberosa). The meadow is also home to Wild Bergamot, (Monarda fistulosa), and the diminutive small White Fringed Orchis, (Platanthera blephariglottis), formerly Habenaria blephariglottis. The stand of naturally occurring Butterfly Weed is the largest I have seen in this region, a blaze of fiery orange in late June. 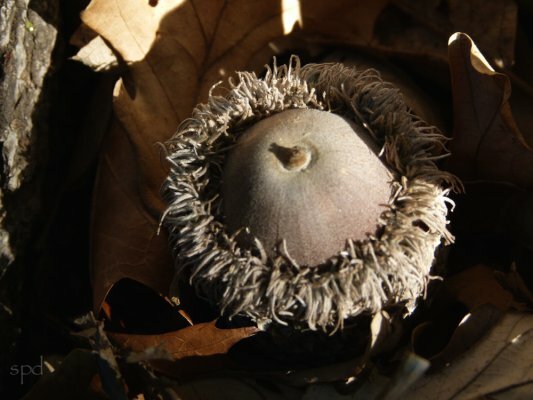 Some of the greatest plant diversity in the park lies in the forests of the floodplain, uplands, and hollows. Riverbend’s floodplain has many rare and unusual plants along with one of the largest displays of Virginia Bluebells, (Mertensia virginica) in the region. Unusual plants along the river include stands of Black Maple, (Acer nigrum), Basswood, (Tilia americana), White Trout Lily (Erythronium albidum), Harbinger of Spring (Erigenia bulbosa), Toadshade Trillium, (Trillium sessile), and very rare plants such as Large Flowered Valerian, (Valeriana pauciflora), Sweet- scented Indian Plantain, (Hasteola suaveolens). If you look along the river’s edge you may see very rare species such as Dwarf Bulrush, (Hemicarpha micrantha), Stalkless Yellowcress, (Rorippa sessiliflora) and Western Beakgrain, (Diarrhena obovata). Or look in the wet areas of the floodplain for Lizard’s Tail, (Saururus cernuus) nodding its flowering head. 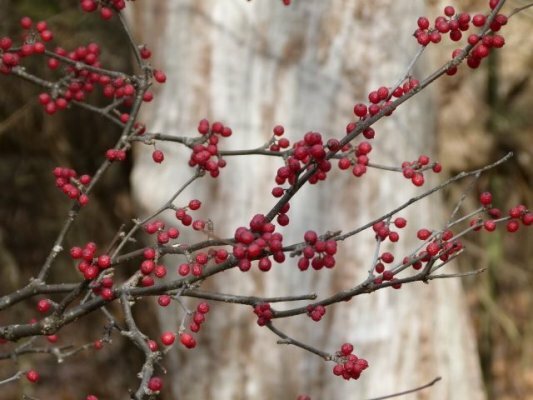 And anywhere you walk along the river’s edge you will likely see American Elm, (Ulmus americana), Slippery Elm, (Ulmus rubra) or Shumard Oak, (Quercus shumardii). As you climb up from the river into the steep hollows you discover a whole other world of plants in the thick shaded forests, where Chestnut Oak Forests and Basic Mesic Forests have stands of Mountain Laure,l (Kalmia latifolia), the delightfully fragrant Pinxter Flower, (Rhododendron periclymenoides), and wonderful little surprises like Showy Orchis, (Orchis spectabilis). Witch Hazel, (Hamamelis virginiana) blooms in patches along the ridges and native Hydrangeas cling to rocky bluffs and cliffs. If you know where to look you may even catch a glimpse of one of the Washington region’s rarest of all plants Mountain Spleenwort, (Asplenium montanum). 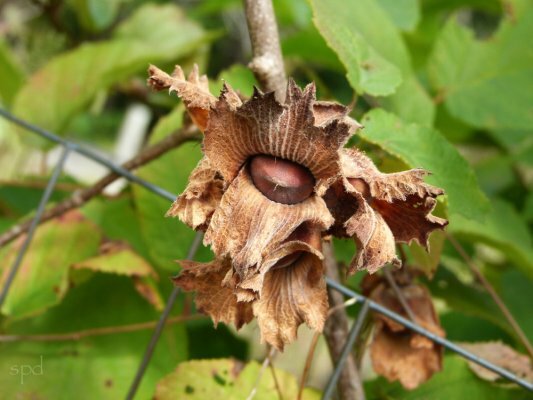 You may also notice some interesting diversity among the hardwood trees such as Chinkapin Oak, (Quercus muehlenbergii), Chestnut Oak (Quercus montana) and Laurel Oak, (Quercus hemisphaerica). 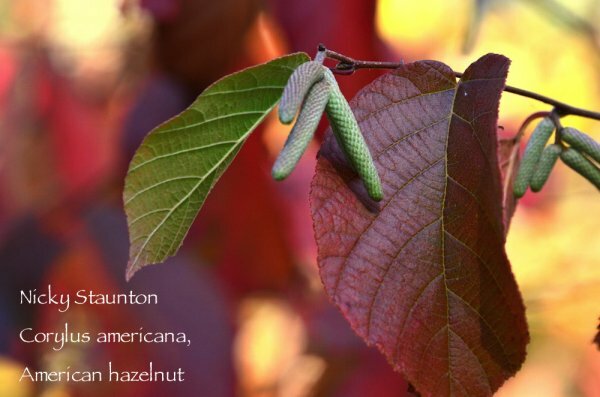 No matter where you walk at Riverbend Park there are interesting and unusual native plants that help you understand why the parks of the Potomac Gorge represent some of the greatest biodiversity on the East Coast.